With no national tournaments on the schedule last week, the Top 25 rankings saw little change as only four teams lost ground in the rankings and only three teams exited. The top five teams also stayed the same. Some of that could change next week as playoffs begin in several states and Las Vegas hosts a national tournament featuring the top Catholic baseball programs in the country. Three teams in the All-Catholic Classic are in the rankings this week, including No. 9 St. Laurence (Burbank, Ill.) and rankings newcomers De La Salle (Concord, Calif.) at No. 22 and St. Rita (Chicago) at No. 24. Subtle changes as three new teams enter this week's rankings. The only major change in the rankings saw Lake Travis drop from No. 6 to No. 10 after losing to No. 8 Georgetown in a battle between two of the top teams in Texas. In another inter-state battle, Calvary Christian Academy (Fort Lauderdale, Fla.) knocked American Heritage (Plantation, Fla.) out of the rankings with a 4-1 win. New Teams: De La Salle (Concord, Calif.) at No. 22, East Lake (Tarpon Springs, Fla.) at No. 23 and St. Rita (Chicago) at No. 24. Dropped out: No. 19 American Heritage (Plantation, Fla.), lost once; No. 23 JSerra Catholic (San Juan Capistrano, Calif.) lost three times; No. 24 Davie (Mocksville, N.C.) lost once. On the Bubble: Bob Jones (Ala.), 32-6; Mesquite (Ariz.), 22-4; Bryant (Ark. ), 22-2; Huntington Beach (Calif.), 19-5; Yucaipa (Calif.), 19-4; Notre Dame (Calif.), 18-5; Buchanan (Calif.), 18-2; Regis Jesuit (Colo.) 10-1; Stoneman Douglas (Fla.), 14-2; Columbus (Fla.), 16-2; Jesuit (Fla.), 16-2; Mitchell (Fla.), 18-0; Mosley (Fla.), 16-1; Winder-Barrow (Ga.), 21-3; Parkview (Ga.), 22-4; Hillgrove (Ga.), 22-5; St. Xavier (Ky.), 14-2; Sam Houston (La. ), 28-4; Biloxi (Miss. ), 23-2; Nixa (Mo. ), 11-1; St. Augustine Prep (N.J.), 9-1; Providence (N.C.), 18-1; Malvern Prep (Pa.), 15-2; Fort Mill (S.C.), 21-1; Farragut (Tenn.), 22-2; Prosper (Texas), 24-4; Corpus Christi Veteran's Memorial (Texas), 26-3-1. Player of the Week: Jalen Greer of St. Rita had three home runs, including two in one game, to lead the Mustangs to a pair of wins. St. Rita plays in the All-Catholic Classic this week in Las Vegas. Greer has five home runs on the season. Prospect of the Week: Blaze Jordan, DeSoto Central. Regarded as the No. 1 recruit in the Class of 2021, Jordan had a huge week for DeSoto Central as he went 8-for-9 with 8 runs, 9 RBI (including 8 in one game), three home runs (including a grand slam) and two doubles. For the season he is batting .450 with seven home runs. Game of the Week: Georgetown 7, Lake Travis 5. In a battle between two of the top teams in Texas, Class 5A Georgetown knocked off Class 6A Lake Travis to move ahead of the Cavaliers in the national rankings. The Eagles built a 6-2 lead before giving up a three-run rally Lake Travis in the bottom of the sixth. Noah Thompson had a pair of home runs including one that ignited a three-run rally in the top of the sixth. Game to Watch: De La Salle (Concord, Calif.) vs. Don Bosco Prep (Ramsey, N.J.). These two teams once met on the football field with Don Bosco Prep prevailing. The two teams meet in Las Vegas at the All-Catholic Classic. De La Salle, which enters this week's rankings at No. 22, comes in as the favorite. Streaks: Page County (Shenandoah, Va.) has now won 37 games in a row after beating Riverheads 3-0 and Lee 10-1. Sophomore T.R. Williams had another huge game as he threw a two-hitter with 14 strikeouts against Riverheads. Page County is 11-0 on the season. Tournaments: The first All-Catholic Classic takes place in Las Vegas this week with some of the best Catholic schools in the country, including St. Laurence (Burbank, Ill.), Bishop Gorman (Las Vegas), St. Louis (Honolulu), and De La Salle (Concord, Calif.). The Boras Classic North — Top teams from Sacramento and Bay Area compete for the right to play JSerra Catholic (the Boras Classic South winner) in the championship game. San Diego Lions Tournament — Over 100 teams compete at one of the largest tournaments in the nation. Results: Defeated Boswell (Fort Worth) 10-0 and 8-0. Stats: Bobby Witt Jr. went 2-for-4 with two doubles and Chandler Freeman had a home run in the first game. Witt was 2-for-3 with a triple in the second game. This week: Brewer (Fort Worth) on Tuesday and Thursday, Bell (Hurst) on Saturday. Results: Defeated Doral Academy 11-1. Stats: Benino Mendella had a double and a home run and Josh Rivera hit a home run against Doral. Brennan Malone got the win, giving up no runs on two hits with five strikeouts. This week: Gulf Coast (Naples) on Wednesday, Dunedin on Friday. Stats: Chad Ricker was 2-for-3 with a triple and four RBI and Dillon Carter was 2-for-2 with a triple against Krum. Hayden Clearman, Alex Gonzales and Cade Merka all had a doubles against Trinity Christian. This week: Decatur on Tuesday, Bridgeport on Thursday and Friday, South Grand Prairie (Grand Prairie) on Saturday. Results: Defeated West Brunswick (Shallotte) 14-0 and South Brunswick (Southport) 3-0. Stats: Blake Walston improved to 6-0 with a win over West Brunswick, striking out eight. Kyle Smith was 3-for-3 against South Brunswick. This week: Ashley Easter Tournament. Results: Lancers swept three from JSerra Catholic (San Juan Capistrano) winning 2-1, 4-0 and 4-2. Stats: Max Rajcic got the win in the first game, striking out eight. Jonathan Guzman struck out seven to get the win in the second game. Christian Rodriguez struck out eight for the win in the third game. This week: Servite (Anaheim) on Wednesday and doubleheader on Saturday. Results: Defeated Cypress Woods (Cypress) 6-5 and 7-1. Stats: Fabian Mayfield was 3-for-3 with a double and a triple and two RBI, and Matt Thompson had a pair of doubles and two RBI. J.J. Goss struck out 13 in the second game and also had a two doubles. Colton Owen added a home run. This week: Bryan on Monday and Thursday. Results: Defeated Cedar Creek 10-0 and 12-0, defeated Lake Travis 7-5. Stats: Jack Brinley threw a five-inning no-hitter with five strikeouts in the first game and Cole Posey had a double and a triple. Grant Wood threw a perfect game in the second contest, striking out eight. 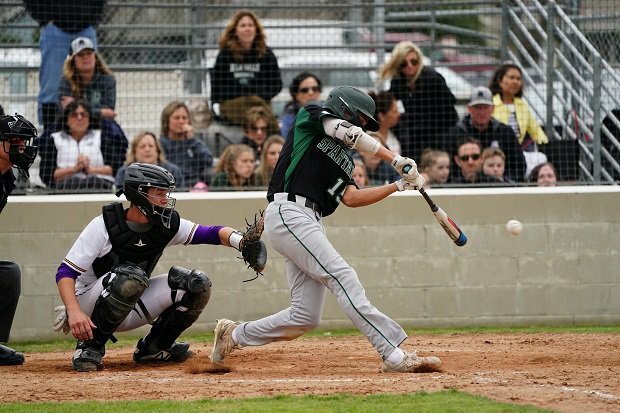 Noah Thompson hit two home runs and Wyatt Childress hit one in the win over Lake Travis. This week: Hutto on Tuesday and Thursday. Results: Defeated Sulphur 3-0, New Iberia 12-0 and LaGrange (Lake Charles) 7-2. Stats: Carter Quinn had a home run against New Iberia. Results: Defeated Chicago Mt. Carmel 17-10 and 5-3, Neuqua Valley 4-0 and Clemente 13-1. Stats: Matt Dornbos, Alex Gasbarro and Matt McCormick all homered in the first game against Mt. Carmel, while Matt Zahora struck out 11 in the second game. Zahora had two doubles against Clemente, while McCormick and Vytas Valincius each had a triple. This week: De La Salle (Concord, Calif.) on Monday, Don Bosco Prep (Ramsey, N.J.) on Tuesday, Marian Catholic on Wednesday. Results: Defeated Lehman 14-2 and Westlake (Austin) 6-3, lost to Georgetown 7-5. Stats: Parker Guerin had a grand slam, Austin Plante was 2-for-3 with a home run and three RBI and Brett Baty was 2-for-2 with a home run and three RBI against Lehman. Baty had a home run against Westlake and Jimmy Lewis got the win, striking out eight. This week: Del Valle on Thursday. Results: Defeated St. Francis (La Canada) 2-1, 10-8 and 16-1. Stats: Sam Hliboki struck out 11 in the first game, Drew Bowser was 2-for-4 with a double and four RBI while Pete Crow-Armstrong was 2-for-5 with a triple. The Wolverines had seven doubles in the third game. This week: Loyola (Los Angeles) on Monday, Wednesday and Thursday. Results: Defeated Valencia (Placentia) 19-7 and 9-2 and San Clemente 5-4. Stats: Braden Murphy was 2-for-2 with a home run and four RBI while Elias Rios was 3-for-4 with a double and four RBI in the first game. Cameron Repetti was 2-for-4 with a triple and three RBI in the second game. This week: Kennedy (La Palma) on Wednesday and Friday. Results: Defeated Bartlett 3-0, Horn Lake 17-0 and Hernando 12-1. Stats: Blaze Jordan hit a home run against Bartlett and then two more, including a grand slam, against Horn Lake. He finished with eight RBI in the second game. Jordan went 3-for-4 with two doubles against Hernando. Shemaar Stapleton added a home run. This week: Southaven on Tuesday and Lewisburg on Saturday. Results: Defeated Westwood (Mesa) 14-8, Skyline (Mesa) 10-3 and 4-0. This week: Dobson (Mesa) on Tuesday and Thursday, Valley Vista (Surprise) on Wednesday. Results: Defeated Ada 1-0 and 12-0, Berryhill 9-1, Bishop Kelley 8-0 and Kickapoo 7-5. Stats: Jace Beck struck out 11 in the first game with Ada. Tyler Henry threw a no-hitter with four strikeouts in the second game. Ty Vanmeter was 2-for-2 with a double and four RBI against Berryhill. Colby Reed struck out 12 and Jerrad Beam hit a home run against Bishop Kelley. Vanmeter had a home run and four RBI against Kickapoo. This week: Byng on Monday and Tuesday, Tecumseh on Saturday. Results: Defeated Atlantic Shores Christian (Chesapeake) 5-4 and Miller (Charlottesville) 12-2 and St. Christopher's 3-2. Stats: Jay Woolfolk went 3-for-4 with a double against ASC while Brett Cook, Jack Hall and Nick Neighbors all hit home runs against Miller. Jamari Baylor had a home run against St. Christopher's. This week: Norfolk Academy on Monday, Steward (Richmond) on Tuesday, Collegiate (Richmond) on Wednesday. Results: Defeated Piper (Sunrise) 10-1 and Deerfield Beach 7-3. Stats: Jared Campbell had a triple while Jaden James was 2-for-3 with a double. James Wilson struck out 10 against Deerfield Beach. This week: Everglades (Miramar) on Wednesday. Results: Defeated Jupiter 13-1, Southwest 4-0 and Brito 6-5. Stats: Kevin Martin had two home runs and Jayden Melendez had a double and a home run against Jupiter. Richard Benitez was 2-for-3 with a double against Southwest while Jamar Fairweather had a double and a home run and Martin added another homer against Brito. This week: Monsignor Pace on Wednesday, St. Thomas Aquinas on Thursday. Results: Defeated American Heritage (Plantation) 4-1 and Chaminade-Madonna (Hollywood) 5-3. Stats: Ben Rozenblum had a home run against American Heritage. Kyle Tako and Ty Hollandsworth each had a home run against Chaminade. This week: Hialeah Educational Academy on Tuesday, Westminster Academy (Fort Lauderdale) on Wednesday, SLAM (Miami) on Thursday. Results: Defeated Brooks DeBartolo Collegiate 10-0, Northeast 13-4 and Berkeley Prep 9-6. Stats: Josh Emerson struck out 10 and Samuel Gordon, Nolan Hudi and Bo Planeta all hit home runs against Brooks. Pierce Chambers and Charles Stevens both homered against Northeast. Tommy White was 3-for-4 with a double against Berkeley Prep. This week: Lakeland Christian on Monday, Clearwater Central Catholic on Tuesday and Dunedin on Thursday. Results: Defeated Fort Bend Austin 5-1 and Fort Bend Bush 17-0. Stats: Will Pendergrass and Jack Baker each had a double against Austin. Five pitchers combined for a no-hitter against Bush with Pendergrass hitting a double and a triple, Austin Bradbury hit two doubles and Gabe Colaianni had a home run. This week: Fort Bend Travis on Tuesday and Fort Bend Elkins on Thursday. Results: Defeated California (San Ramon) 6-0, Foothill (Pleasanton) 7-6 and Livermore 12-2. Stats: Chris Santiago had a double against California. Charles McAdoo had three RBI against Foothill. Nick Fusari had a double and a triple and Blake Burke had two doubles against Livermore. This week: St. Laurence (Burbank, Ill.) on Monday, Marian Catholic (Chicago Heights) on Tuesday and Don Bosco Prep (Ramsey, N.J.) on Wednesday, all in Las Vegas at the All-Catholic Classic. Results: Defeated Countryside (Clearwater) 11-0 and 12-2. Stats: Josh Pigozzo was 2-for-4 with a double and three RBI in the first game and Wilbert Javier-Vargas had a double and a triple in the second game. This week: Tampa Prep on Monday, St. Petersburg on Wednesday and Friday. Results: Defeated Loyola Academy 17-4, lost to Loyola Academy 21-17, defeated Chicago Mt. Carmel 12-7 and 5-1. Stats: Jalen Greer had two home runs and Gavin Motti had one against Loyola Academy. Bobby Atkinson had two home runs, including a grand slam, and Luke Napleton had a homer in the loss to Loyola Academy. Jalen Greer had a home run in the first game against Mt. Carmel and Matt Callahan and Napleton each homered in the second game. This week: St. Louis (Honolulu) on Monday in Las Vegas; Bishop Gorman on Tuesday in Las Vegas, Juan Diego Catholic (Draper, Utah) on Wednesday in Las Vegas. Results: Defeated West Hall 15-0 and 15-0 and Chestatee 4-2. Stats: Jake Smith had two doubles in the first game, and CJ Abrams, Trey Baker and Carson Harof each had a home run in the second game with Abrams adding a double and Bret Buursema knocking two doubles. This week: Chestatee on Monday, Marist on Wednesday and Thursday.